In the tradition of Cormac McCarthy, Larry Brown, and James Lee Burke, Rivers is an enthralling, darkly beautiful novel set in Mississippi against the backdrop of a series of devastating storms that pummeled the American South in the years since Hurricane Katrina. In the near future, a climate shift has caused massive damage to the Southeastern United States, eroding the coastline and forcing people from their homes. But one man has stayed behind. Cohen’s wife and unborn child were killed during a mandatory evacuation, and when he returned home to bury them, he never left, building and rebuilding his house as the rain, wind, and darkness worked against him. Returning from a supply run one day, Cohen picks up two teenage hitchhikers—a boy and an injured Creole girl—and his solitary existence is irrevocably shattered. He is attacked and left for dead, his house ransacked, all his carefully accumulated food and supplies gone—but worse, the last precious mementos he had of his wife and child are now in the hands of strangers. Summoning his last reserves of strength, Cohen sets off to gain justice for all he has lost. With enormous passion and reverence for the post-Katrina South, Rivers evokes the ravages of nature as never before. It is an enthralling, gorgeously written tale of survival and redemption that heralds a major new voice in literary fiction. Michael Farris Smith is a native Mississippian who has spent time living abroad in France and Switzerland. He has been awarded the Mississippi Arts Commission Literary Arts Fellowship, the Transatlantic Review Award for Fiction, the Alabama Arts Council Fellowship Award for Literature, and the Brick Streets Press Short Story Award. His short fiction has twice been nominated for a Pushcart Prize and his essays have appeared with The New York Times, University Press of Mississippi, and more. Limited first edition copies of his debut novella, The Hands of Strangers, are available from Main Street Rag Publishing in Charlotte, North Carolina. He lives in Columbus, Mississippi, with his wife and two daughters. In this memoir, iconic singer Linda Ronstadt weaves together a captivating story of her origins in Tucson, Arizona, and her rise to stardom in the Southern California music scene of the 1960s and ’70s. Born into a musical family, Linda’s childhood was filled with everything from Hank Williams to Gilbert and Sullivan, Mexican folk music to jazz and opera. Her artistic curiosity blossomed early, and she and her siblings began performing their own music for anyone who would listen. Now, twelve Grammy Awards later, Ronstadt tells the story of her wide-ranging and utterly unique musical journey. Ronstadt arrived in Los Angeles just as the folk-rock movement was beginning to bloom, setting the stage for the development of country-rock. After the dissolution of her first band, the Stone Poneys, Linda went out on her own and quickly found success. As part of the coterie of like-minded artists who played at the Troubadour club in West Hollywood, she helped define the musical style that dominated American music in the 1970s. One of her early back-up bands went on to become the Eagles, and Linda would become the most successful female artist of the decade. She has sold more than 100 million records, won numerous awards, and toured all over the world. Linda has collaborated with legends such as Emmylou Harris, Dolly Parton, Aaron Neville, J.D. Souther, Randy Newman, Neil Young, Bette Midler, and Frank Sinatra, as well as Homer Simpson and Kermit the Frog. By the time she retired in 2009, Ronstadt had spent four decades as one of the most popular singers in the world, becoming the first female artist in popular music to release four consecutive platinum albums. In Simple Dreams, Ronstadt reveals the eclectic and fascinating journey that led to her long-lasting success. And she describes it all in a voice as beautiful as the one that sang “Heart Like a Wheel”—longing, graceful, and authentic. Linda Ronstadt has received twelve Grammy Awards, two Academy of Country Music Awards, and one Emmy Award, as well as several Tony and Golden Globe nominations. She lives in San Francisco with her family. We will pick the winners on October 4th. 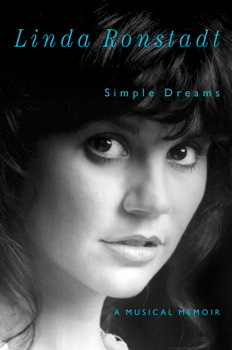 I would love to read Simple Dreams…Linda Ronstadt is one of my all time favorite singers. Been a fan of Linda Ronstadt since 1970 and would love to read this book. Its not out in the UK until 21st November and I can’t wait that long !! Love Linda since the 80’s. Such powerful vocals and should be in the Rock and Roll Hall of Fame long ago! I would love to read both of these books. Sounds like some great reading. I would like to read about Linda’s life and times, great singer. I have been a fan since my teen years, would luv to read the book. I have been a fan since I was a teenager, I am 54. Learning that her health is not good has really saddened me and intrigued me to know more about her, I have seen her in concert numerous times and have pics from back in the day when pics were allowed at concerts. My first husband plays guitar and when he and I dated, he would play and I would sing as many of the songs she had done as was out at that time frame, we have since divorced long ago but those days with Linda r a pleasant memory forever. Dying to read Linda’s new book, and the other offering looks great as well! Linda is one of my first “simple dreams”! Would love to read these books! Looking forward to Murder, Mayhem in Muskego too! I’ve been trying to avoid contests while I whittle my TBR list down. HOWEVER … Linda Ronstadt??? She was one of my favorites back in the day … I HAVE to get in on this one! !